The “Finger Bow” is a new concept in bow design. It was created for expanding techniques in playing upright/double bass but could also be used on other instruments. The “Finger Bow” allows the player to instantly switch between finger style (pizzicato), and bowing (arco) with a flick of a finger. The bow is 10 3/8” long, and made of lightweight and resonate poplar wood. It is not intended to replace a traditional longer bow but to be a new tool for creative expression. It is designed to be positioned on the 3rd finger by inserting your finger into the top of the stretch strap. Simply position and tighten the stretch Velcro strap and you are ready to go. The “Finger Bow” is available in black and natural finishes and a left-handed version. With an overall length of about 10 ½”, a thickness of ½” and weighing about 1 ½ oz, the Finger Bow is very easy to maneuver. As with many things, each player will develop their own technique for using the Finger Bow. I have had the idea for the Finger Bow since I got my acoustic double bass several years ago. Being a fan of Tony Levin and his "Funk Fingers" and how they attach to your fingers, got me thinking about bow design and new ways of approaching playing with a bow, and the possibility of mixing bowing with finger style at the same time. The Finger Bow prototyping provided me with other new design ideas for larger bows. Finger Bows are largely hand crafted. The basic shapes are laser cut from ½” poplar and the logo is laser engraved. All other work; additional cutting, drilling, filing, sanding, steel reinforcement, appling finish, attaching hardware, bow hair, etc is all hand done and in the USA. Because of all of the hand crafting, each Finger Bow is slightly different. They are made at expanding Hands Music in Atlanta Georgia. Finger Bows like Cymbows do not have the traditional flat ribbon of horse hair. Each one has a full “hank” of Mongolian horse hair tied on at each end. The black sleeve at the rear of the bow is there to protect the hair when tension is applied. Your Finger Bow will arrive with a bit of rosin on it, but you will want to get some rosin of your choice right away to apply as needed. As you bow the rosin will work its way off the hair. Different people prefer different rosins, so there is no perfect rosin for everyone. Many are available. The rosins that are considered very “sticky” can actually grab too much and break the hair when it’s being applied to the bow. Rosin should be applied with the hair fairly tight. "Finger Bows" are available in natural and black finishes and left handed versions. No additional charge for left handed version. Shipping and handling charges will be automatically added at checkout. Please be careful and select the correct option for you. If you are interested in a different option that is not listed or multiple products, please email for info before ordering. We may be able to save you some shipping costs. **Every country is different, and some additional import fees or VAT may have to be paid when your order is delivered. The variations are too diverse for Expanding Hands Music to know. 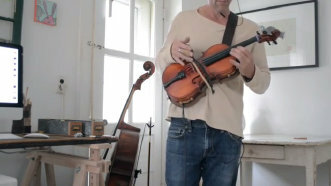 Jon Francis playing his violin with a Finger Bow, improv with a looper and effects.